Editorials from Theslowlane: Facebook: too big to grow? Facebook: too big to grow? You've heard of banks that are too big to fail. How about corporations that are too big to grow? Less talked about, but possibly a telling issue as people discuss the need to grow our economy and create jobs. Little doubt that Facebook has been an extremely sucessful company. 800 million users worldwide, influential in social change, a household word. All this before Facebook started trading on the stockmarket. Can they top what they've already accomplished? Did Facebook wait too long before their ipo? Did their stock go public just in time for them to reach market saturation? Is there anymore room to grow? This is an issue facing many larger than life corporations as well as our economy as a whole. Is there more room for expansion or are many of our corporations just too large? No room to grow and thus facing stagnation. Where will the new jobs come from? Another problem has to do with the transition toward what is called an "information economy." Futurist author Alan Toffler talks about civilization going through various transformations. We've gone from the stoneage to the agricultural age. From the agricultural age, we've progressed into the industrial era. Now we are headed into the information age. Each transition brings economic disruption as old jobs die while new jobs and ways of doing business emerge. The information age seems to be a tough one for figuring out how to make money, or, to put it a better way, "monetize the activity." No wonder Facebook stock dropped as soon as it went on the market. There is a lot of enthusiasm and activity on Facebook with people posting worldwide, but does that energy translate into money? I see this as an analogy for the information age. An era when our old modles of business that were developed for the industrial age are less useful today. Newspapers are struggling in the same way. Does journalism still pay, or is it being somewhat replaced by what is often called "crowd sourcing?" Seems like we are entering a golden era for volunteerism and grassroots networking on the internet, but meanwhile, how do we pay for food and rent as well as other things that are still influenced by our industrial mindset. 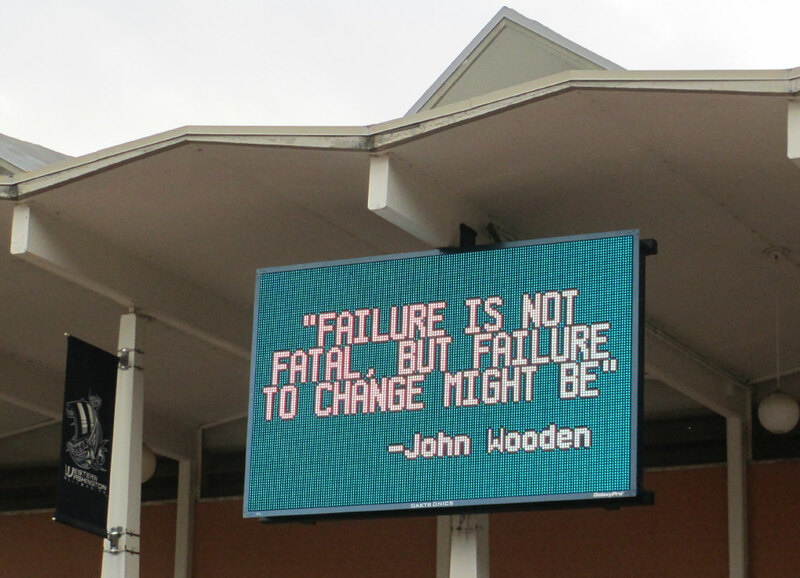 Reader board at Carver Gym on WWU campus. How many widgets do we have to make to pay the bills and are the widgets we make being properly compensated? Tangible products are the easiest to measure in terms of GDP. Do we need all the material posessions we buy and sell in order to create our economy? Can the Earth support all the billions of new families entering middle class life in places as far flung as India and China in an economy measured with the flow of goods and to some extent services? These are important questions to ponder as we transition toward what could be a golden era of information trading. Like a global conversation, we're doing it, but there is an old phrase that says "talk is cheap." It's time for some new thinking about our economy.